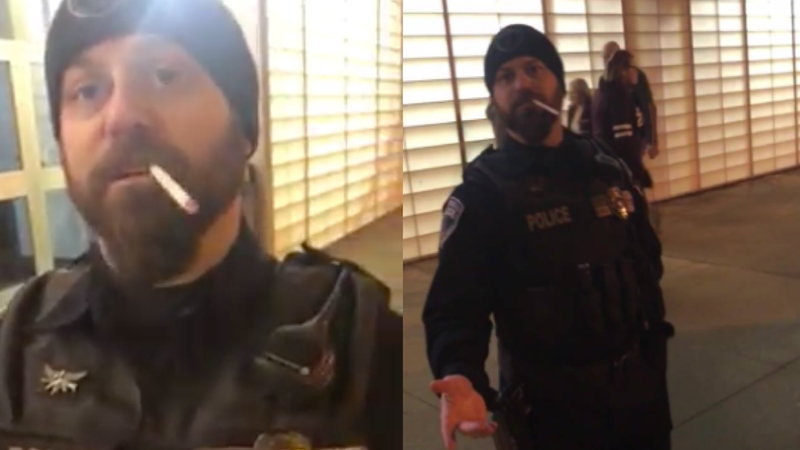 The video shows a police officer walking up to the person operating the camera and asking for a light for his cigarette. The Root could not confirm that the cigarette was a Marlboro Red, but our investigative forensics team assured us that they could determine from the circumference of the paunch of his belly that the gentleman in question sometimes smokes Marlboro Reds, though the thinness of the officer’s lips and the angle of the dangling cigarette suggest that it could be a Pall Mall. The theater employee suggests that one girl “separate herself,” saying that she could go back in, but the other two had to stay out. The officer intervenes, obviously aggravated by his impending nicotine withdrawal, and informs all three of the girls that they are kicked out of the establishment. “Well, he’s calling the shots,” says the theater worker in the J.C. Penney clearance-rack suit. “Because they’re behaving like an animal,” explains the assistant to the deputy vice manager of popcorn operations as he walks up to the woman who is filming the incident, breathing a satanic mist onto the camera lens. Officer Smoky then walks up to the woman, his Pall Mall now smoldering from the light that he received from his brief commune with the Beelzebub, and tells the woman she has to leave. When she tells him that she paid her money and that her kids are inside the theater, Puff the Magic Grand Dragon pulls out his handcuffs, somehow talking while not dropping the cigarette from between his lips. The woman backs up, and the cop grabs her while telling her to leave the premises. At no point does he tell her she is under arrest. Then the cop grabs her arm, throws the woman to the ground and slaps handcuffs on her. The woman exclaims to the undersecretary to the assistant director of ancillary ticket tearing that she has not broken the law and asks what she did wrong. “Resisting arrest,” Officer Marl “Bo” Roman says. “I didn’t break any laws; get off of me,” the woman screams as the video ends. Although the incident is indicative of how white people view black youths and how cops treat ordinary citizens, in this particular case, if justice does not prevail, there’s always the chance that lung cancer will. The Root has reached out to Melanie Carter and the Phoenix Theatres in North Versailles for comment.